Theodore Robinson, born on June 3, 1852 was the first American artist who painted in the Impressionist style. 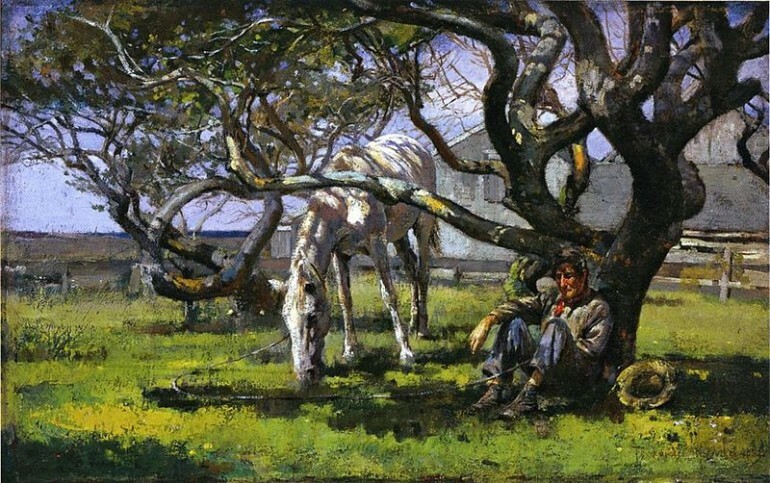 Theodore Robinson’s works are regarded as the most outstanding works in the American Impressionist style. But while he was considered an Impressionist, his painting style was varied, having developed his own personal way of painting that was more lyrical than traditional Impressionism. He was successful in combining the principles of structure and form with the modern doctrines about color and light. He frequently visited the region of Giverny and became close friends with one of the top French Impressionists of the 19th century, Claude Monet. From 1874 to 1875 he attended classes at the National Academy of Design in New York and helped establish the Art Students League, as well as taking classes there. Going to the art capital, France, was a dream Robinson had, just like most of his contemporary American painters. Eventually he studied at the atelier of Carolus Duran (Charles-Emile-Auguste Duran) in 1876. He also took lessons fromAdolph Yvon and Jean-Léon Gérôme at the Ecole des Beaux-Arts. While taking classes in France, Robinson painted figures and landscapes in the Realist style, drawing inspiration from the works of French artists belonging to the Barbizon School. During those years, he spent his summers at the Grèz-sur-Loing where he met fellow American artists Will H. Low and Birge Harrison. During a trip to Italy, he met and befriended James A. McNeill Whistler, another American artist who dabbled in Impressionism for a brief period. Theodore Robinson went back to America and took a teaching job in New York. He did many kinds of projects for Prentice Treadwell and John La Farge and painted views from Nantucket, Vermont and Boston, working alongside other American artists such as Joe Evans and Abbott Thayer. He was able to return to France late in the 1880s and stayed in Paris, visiting and painting near the Barbizon in Grèz-sur-Loing and Cernay-la-ville. He first visited Giverny in 1885 but he became closely associated with the area starting in 1887. He stayed in Giverny for four years. From then on he worked in the area with other artists from North America such as William Blair Bruce from Canada and Americans Willard Metcalf, Theodore Wendel, Henry Fitch Taylor and John Leslie Breck. They fell in love with the place and declared it the ideal location for painting en plein air. Premier Impressionist Claude Monet’s residence was located in Giverny. 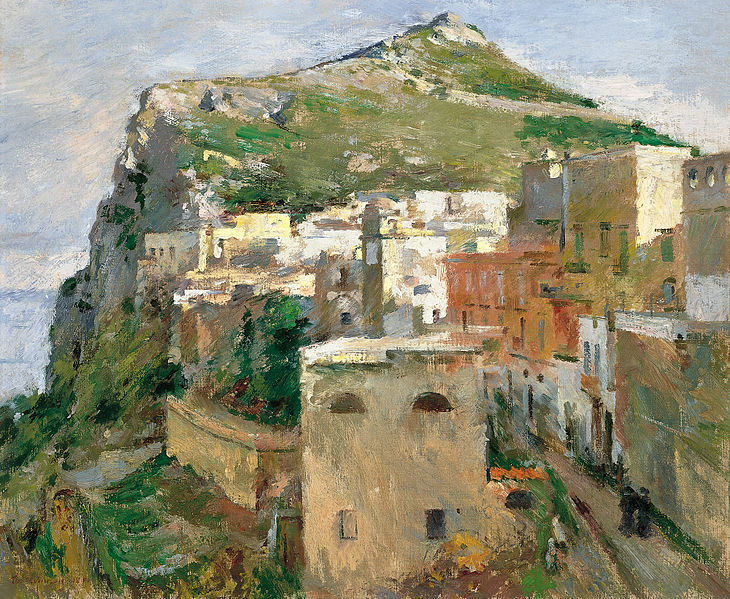 Although he basically followed the Impressionist style, Robinson continued to experiment and developed a unique version of the art movement, emphasizing form and structure while still maintaining the movement’s delicate and light palette and with broken and loose brushwork. He also did not forget the rules of good draftsmanship and his academic training, which included the realistic representation of nature. Robinson was even the first American who lived in Giverny who also specialized on drawing figures, painting several canvases showing local French women going about their daily chores. It was during the latter years of his stay in Giverny that he created some of his most beautiful works with figures, including “La Débâcle” and quite a good number of landscapes, the most notable of which was “Bird’s Eye View of Giverny, France.” It became the first painting in the Impressionist style that he exhibited in his home country. Robinson was one of the very few foreign artists who were able to get close to Claude Monet. Their close friendship transcended that of mentor and pupil. Theirs was a true friendship borne out of mutual respect. They were able to critique each other’s work and socialize on many occasions. Robinson painted “The Wedding March” which chronicled the wedding of Suzanne, Monet’s stepdaughter to Theodore Butler, an American painter. While he was staying in Giverny, Robinson also made a few trips to New York, which gave him the chance to spread Impressionism to other artists. Most of the paintings he created in Giverny were also included in various exhibitions in Philadelphia and Manhattan. When he eventually moved back to New York, he created some of his most colorful and beautiful landscapes, showing scenes from Delaware Canal and Erie. He also gave summer classes in outdoor painting at Evelyn College in Princeton (New Jersey) and at the Brooklyn Art School.